Alrose Villa is a beautiful 1 bedroomed first floor apartment. It has an amazing wrap around balcony; where you can sit and watch the sun rise and set, With sea and hill views and the lights of the town in the distance. The villa has an entrance porch and a grand staircase leading to the first floor where you will find flat 4. Once in the apartment leading off the hallway you will find the shower room( wc, basin, shower cubicle), Bedroom (double bed with memory foam mattress) single bed on request, double wardrobe and chest of drawers. You can gain access to the balcony from the bedroom. The open planned lounge/kitchen is light and airy with another door leading out onto the balcony. The lounge has a leather 2 seater sofa and 1 arm chairs, TV and cabinet, there is a table with 4 chairs and an open planned well equipped kitchen. The Villa is suitable for 2/3 people sharing the main bedroom. Outside is a secluded well established communal garden with table and chairs and washing line. There is an allocated parking bay for the apartment at the front of the property. The property is on the flat to the beach and town. It is on the main bus route to Studland, Sandbanks, Poole and Bournemouth. There are many leaflets, bus timetables and information/ maps within the property and the Tourist Information centre is only a few minutes walk away. Shower room with wc, basin and shower cubicle. Open planned living / kitchen area. There is a 2 seater sofa and 2 arm chairs, tv and cabinet unit. Open-plan lounge/living room with seating and separate kitchen area. Access to wrap around balcony. Separate bedroom with access to the balcony and separate shower room with W.C.
you can rent many water sports equipment on swanage beach. There are tennis courts 5 minute walk away at beach gardens. You can also play mini golf. 5 minute drive to the nearest golf club with stunning views overlooking Poole harbour. Situated within Studland national trust land. 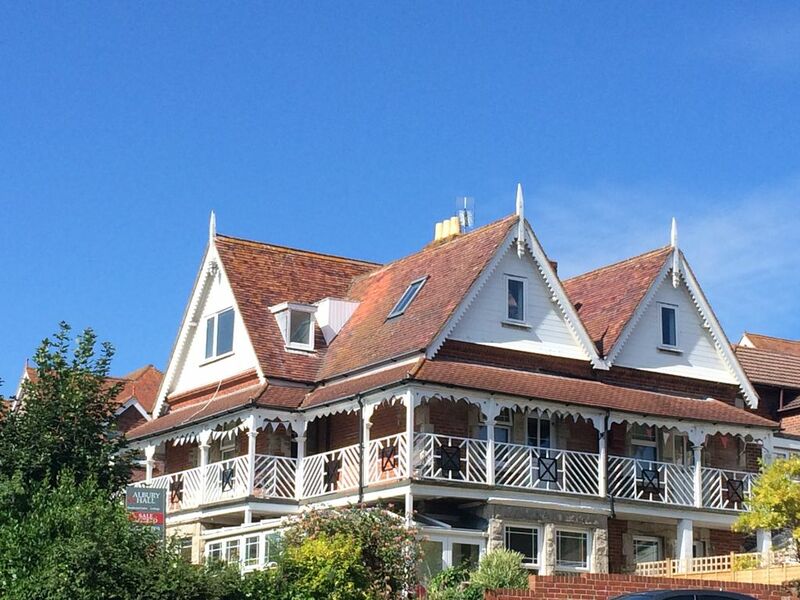 The Villa is situated within minutes of the beautiful beach of Swanage bay. The town/shops/restaurants are only a 5/10 minute walk away. It's within easy reach to many beautiful places :10 minutes by car to the dunes of Studland beach :15 minutes by car to the historical village of Corfe Castle. There is also a new water park not only perfect for children but adults too : 30 minutes will get you to monkey world and the Tank Museum. But you can leave your car behind and walk the beautiful Jurassic coastal path taking you north to old Harry rock and to Studland or south to Durlston castle, The light house, dancing ledge, seacombe, winspit, kimmeridge and much more.......The Villa has views of the beach/ purbeck hills from the bedroom/ kitchen and the stunning wrap around balcony . There is also a lovely communal garden with table and chairs. The Villa has its own allocated parking bay . A lovely apartment just right for a couple or a small family. The apartment has pretty much everything you need for a short break with the bonus of a balcony with a sea view. We were lucky enough to enjoy some sunshine (in march) and a glass of prosecco, on the balcony. It was perfect. The beach, shops and pubs are a short walk away. I would recommend. Very clean and tidy, lovely comfy bed and very well kept bathroom. A very short walk in to town- an ideal location. Stunning location and well equipped beautiful Villa. The flat is in an ideal position as it is only a short walk along the seafront to all the amenities that Swanage has to offer. Do not be concerned with the exterior of the building. The interior is spacious, well appointed and spotlessly clean. It is more than adequate for two adults. Swanage is lovely little town with plenty to do and see, including Studland, Corfe Castle and Brownsea Island. I would recommend this property. I booked this apartment for myself and two daughters at the last minute due to an unexpected change in holiday plans, and it was a great success. The flat was very clean and nicely decorated, the beds were very comfortable and it was great to have the balcony to sit and eat and enjoy the view. It is in a good location, only 5 mins stroll down to the beach - which delighted my girls who spent many hours each day in the sea and playing on the beach as we were very fortunate with the weather. Very easy and pleasant walk along the edge of the beach to get in to the town centre for the cinema or pubs and restaurants and of course the ice cream stalls, which are ubiquitous, again to the delight of my girls! I would highly recommend this one bed apartment which sleeps 3 yet doesn't feel cramped at all. I was lucky enough to be the first person to rent this apartment following a complete renovation earlier in 2016. I can thoroughly recommend it and I hope to return for Swanage Carnival next year. It's in a perfect location to arrive, park the car in it's allocated bay, and leave it there for the week - no need for it! Everything is a short walk away - beaches are 5 minutes, town centre and steam railway are 10 minutes, and the end of the pier about 15 minutes - all of it a level, easy stroll by the sea. The apartment has a large living room with comfortable chairs, settee and tv, and a well appointed kitchen plus dining area with all I needed (including some beers already chilling in the fridge). The double bedroom is huge, with built in wardrobes and access to the balcony, and the 3 piece bathroom is compact, with a great power shower. However, the best feature of Alrose villa is the wrap around balcony, which is great for relaxing with a morning coffee or an early evening aperitif, admiring the sea view towards Swanage. I had a great holiday there! PPS The Red Lion is the best pub in Swanage - both for real ales and it's food! Swanage town and the beach is a good base from which to explore many things. Not only does Swanage have many restaurants, amusements, ice cream parlors, and plenty of independent, quirky little gift shops, it is the starting point of the Jurassic Coast. Old Harry Rock is a lovely walk over the hill towards Studland with incredible, panoramic views across to Poole Harbour, (the second largest natural harbour in the world) the Isle of Wight, Bournemouth, Mudeford and Christchurch. Going the other direction, you will come to Durlston Castle which is worth a look. There's a small museum, cafe/restaurant and gift shop. The views are beautiful over Swanage Bay, Old Harry and towards Peverell Point. The walk from here to Durlston Lighthouse is great, too. Further along the coastline, you will find Dancing Ledge, Winspit (fantastic caves), Kimmeridge Bay (fossil hunting) and Tyneham, the village lost in time; it was evacuated during the 2nd World War, and represents a snapshot of history that you can really get involved with, you can learn about the families that lived in the long abandoned homes and shops - there's even an old schoolhouse and mini museum - well worth a visit, followed by an easy wander to the beach at Warborough Bay, which is simply breathtaking. Please ensure that the ranges are open before heading out - online or Tourist information and National Trust will have the correct information for you. Why not take a picnic with you? Monkey World and The Tank Museum are definitely worth a day trip as well, whilst you're here, and Corfe Castle is only 15 minutes by car - unless you'd prefer to catch one of the beautiful steam trains, which are still maintained daily by volunteers and enthusiasts, a truly unique and memorable experience - the steam trains run from the period themed station in Swanage Town. There is a new water park - Dorset Water Park, which is great for the whole family - situated in the centre of Corfe, close to the castle. The village of Langton Matravers has Putlake Adventure Farm - perfect for smaller children, whatever the weather (5 min by car). Whatever you do in and around Swanage, please enjoy! On receipt of the final balance key collection details and a receipt will be sent out. Check in time 2pm and check out time 10am.